You have a smile gap that is embarrassing, but also, did you know that tooth loss causes gum and bone recession? Loss of multiple teeth impacts how you eat, speak, and look. Your dentist in Long Island City, Dr. Steven Bizzell, recommends modern dental implants to restore that gap for a beautiful, youthful smile that lasts. A dental implant is a true artificial tooth from root to crown. It is composed of three parts–a titanium implant screw, a metal alloy post, and a porcelain crown, and it resides right in the individual’s healthy jaw bone. A procedure which takes several steps and many months of healing, dental implant restoration results in a natural-looking and functioning tooth that remains in place for decades. The secret to its success lies in titanium metal. Through a fascinating natural process called osseointegration, human bone wraps around the implant, anchoring it to the jaw. Osseointegration takes several weeks to months and requires that the older teen or adult have adequate jaw bone density and be in optimal overall and oral health. After the implant fully integrates, Dr. Bizzell re-opens the surgical site and bonds a metal alloy post to the dental implant. Also, he affixes a beautiful, customized porcelain crown to the post. Color-matched and perfectly shaped to blend in with surrounding teeth, the crown is the finishing touch in the tooth replacement treatment. As time goes on, the bond between the implant and the jaw bone strengthens as the prosthetic tooth receives the substantial forces of biting and chewing. The American Academy of Implant Dentistry states that your dental implant may be the last tooth replacement you will ever need. Implant procedures succeed more than 90 percent of the time, and their retention rate is very similar. Compare that with conventional fixed bridgework which lasts an average of only seven to 10 years and does nothing to preserve the integrity of the jaw bone. Caring for your dental implant is as easy as caring for your natural teeth. Floss around your implant daily, and brush twice a day with a soft brush. Eat a healthy diet, low in processed sugars and carbs, and if you smoke, see your primary care physician about a smoking cessation program. Tobacco contains toxins linked to an infection called peri-implantitis. Similar to advanced gum disease, peri-implantitis is a leading cause of implant failure. Additionally, implant patients should eat a tooth-friendly, low-sugar diet, and drink plenty of water to hydrate oral tissues and to reduce plaque build-up around the implant. See the friendly team at LIC Dental Associates semi-annually for your routine exam and hygienic cleaning. 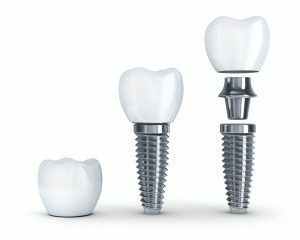 Finally, dental implants are so versatile that dentists such as Dr. Bizzell and his professional colleagues use them in multiples to support full or partial dentures. As a result, smiles with substantial gaps are youthful-looking and function amazingly well. Of course, you do, and Dr. Bizzell and his team will be happy to answer them. Contact LIC Dental Associates today to arrange your restorative dentistry consultation.